I'm so in love with the "My Tweets" BOM that I just couldn't resist working it today. I even re-made the templates using the stitch and wash just so that everything would have the same "treatment" so that when it comes time to wash the quilt there will be no unintended surprises. It took me quite a while to get all the pieces made for the peacocks but you have to remember that this is my first applique project. The thing that gave me the most trouble was those little top knots on the peacock heads. Oh and I lost the little beaks in the construction process, so I'll have to make more of those tomorrow. I pretty much worked on these two birds from lunch time until 8pm. Of course I have my share of distractions with kids that need to be fed, Lego creations that have to be admired, art work that needs to be praised, and bathroom breaks! The hardest thing for me is picking out fabrics. 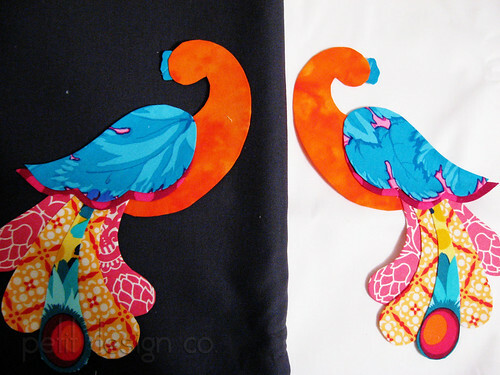 It seems like I auditioned 5-6 fabrics for each section of the bird. I have a stack of about 35-40 fabrics sitting on my desk right now and only 6 fabrics where used. I may go crazy by the time block 3 rolls around! I can't decide which background fabric I want to use. The one on the left is Kona Charcoal and the one on the right is Kona Snow. I'll have to take another look at it tomorrow in some nice natural daylight. I think the Charcoal may be too dark but maybe Kona Coal or Med. Gray would be nice. What do you think? I have been looking at doing this myself but keep talking myself out of it as I have never done this sort of appliqué before. You have inspired me to give it a go since you said you have never done it either. Personally, I think the charcoal is a little dark to showcase these exquisite birds and showcase your fine work. Have a great day and thanks for the inspiration. I personally LIKE the Charcoal. Are those wings a Tula Pink fabric??? It looks pretty awesome. I like both. Finish up the block and lay it out on both fabrics. Take pictures and see which one you like. I do tend to lean toward the charcoal. I'm working on the same block so it's great to see what someone else has done. You totally have me wanting to do this BOM, and I'm not even a big fan of appliqué, especially flowers. I love the fabrics you picked! And I would totally go with a gray background, either the one you have or a more medium one. Absolutely stunning. I think the charcole is a little too dark but the gray might be just the one. Take care and thanks for sharing! You are doing an awesome job! i want to know more about this BOM. what techniques are you using? 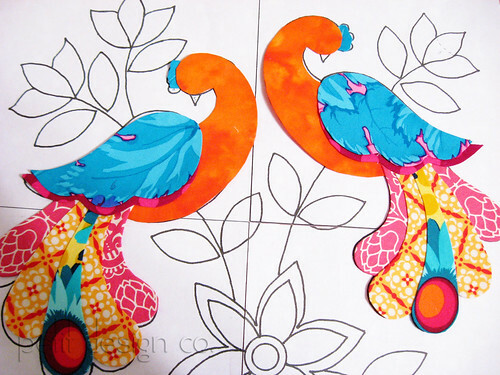 i am currently slaving away on an applique project and desperately want to know i'm not alone.